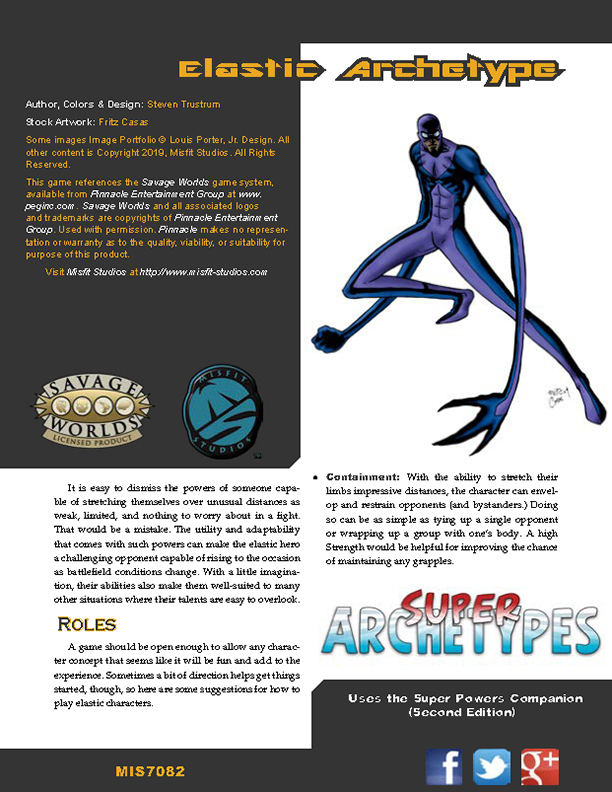 This Super-Powered Savage Worlds RPG release brings you The Elastic Archetype. This ready-to-go character build provides a foundation for you to develop a hero of your own who can stretch their body to superhuman lengths. Gamemasters can also use the archetype as the basis for quickly building NPC heroes or villains off-the-cuff. Looks like this is meant for Adventure Edition, are you planning on updating the other Super Archetypes to SWADE? Cause that would be awesome. Updates are indeed planned down the road for most existing SW products. Right now, though, getting out new product is the focus, especially with striving to get Darwin's World out ASAP. Awesome, I'm a big fan of your products and really excited you guys are putting out Darwin's world.